What does a strawberry plant look like--learn how to identify strawberry plants here. If you want to learn more about the appearance of strawberry plants, please visit this site's "Strawberry Parts" page, which has labeled photos of the parts of both the strawberry plant and it's fruit. Real strawberry plants are more like vines than trees, particularly because of the vine-like stolons ("runners") on many varieties of strawberry plants. 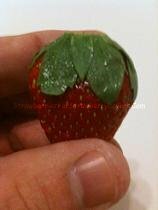 However, there are other species of plants which commonly bear the appellation "strawberry". For instance, there is a so-called "strawberry tree" (Arbutus unedo L.), which is native to Europe. Even though it is not a real strawberry plant, it's fruit is actually edible. There is also a similarly misnomered "strawberry bush" (Euonymus americanus L.), which is indigenous to the eastern half of the United States. This plant's branches root quite easily, just like the stolons of a strawberry plant. However, neither the strawberry tree nor the strawberry bush is truly a form of strawberry plant. (by clicking on the preceding link, you will open the link in a new window). (again, by clicking on the preceding link, you will open the link in a new window).